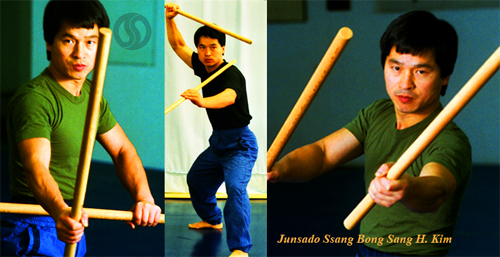 This collection of 16 short instructional videos has lessons from all of the videos in the Junsado instructional series by Sang H. Kim. Ssang Bong literally means double (ssang) stick (bong). There is a time and a situation for use of two weapons, particularly when encountering multiple opponents. You can also practice the double sticks against a solo opponent striking multiple targets simultaneously. You should not favor either of the sticks since, if you do, you will be distracted by your own thoughts of two weapons. Treat them like one set of weapons working together as the two wheels of a cart carry a wagon. Offense and defense should seamlessly flow into another offense and defense. The primary stick should be held firmly in your dominant hand; the secondary stick in the other hand. In a non-combat situation, hold both sticks in your non-dominant hand in a natural stance. There are less than dozen different postures for situations arising: ready posture, middle offense posture, middle guard posture, low defense posture, high defense posture, high low posture, high side posture, side open posture (high-side), frontal open posture (high-low), combat posture (normal fighting position). For defense, the primary hand moves for high, low, inside, and outside blocks; the secondary hand supports the primary hand by executing inside, outside (reverse), and chop blocks. When the primary weapon creates an opening the secondary penetrates further, and then the primary completes the destruction.